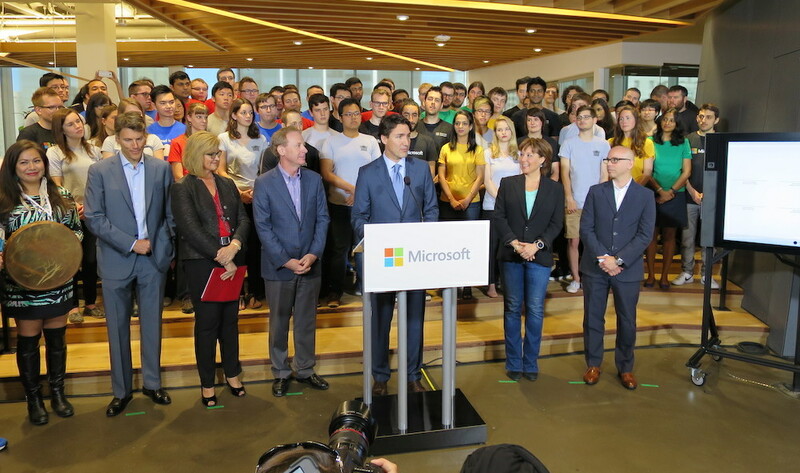 Microsoft Canada officially opened its stunning new Canadian Excellence Centre in downtown Vancouver this morning with the help of Prime Minister Justin Trudeau. The 142,000-square-foot office and development space occupies the entirety of the top two floor plates of Pacific Centre’s Nordstrom building at 725 Granville Street. Two large atriums in the centre of the building and floor-to-ceiling windows wrap the floors, allowing natural light to pour in and provide panoramic views of the city and mountains. A separate atrium with a grand staircase connects the two Microsoft floors together, and the space incorporates wood and other earthly tones extensively. Developers and interns work in open and closed collaboration spaces with plenty of breathing room, including two large multi-purpose community rooms. According to Brad Smith, President of Microsoft, the company invested over $100 million on building the new facility and is “committed to Vancouver”. Microsoft plans to double its Vancouver workforce size from 300 employees to 750 employees from across Canada and elsewhere in the world. “We literally have the opportunity to bring the best of Chilliwack, the best of Chile, and the best of every corner of Canada together,” said Smith. “We are better because we have people from around the world that join us here,” said Premier Christy Clark, who also half-jokingly stated that the company needs to move its Canadian headquarters from Mississauga to Vancouver. The tech sector in Vancouver is worth billions and employs 75,000 people. Another 15,000 people are expected to work in tech over the coming three years. Microsoft still retains its office space in Yaletown near B.C. Place Stadium to house developers for other projects. Its new Centre for Excellence at Pacific Centre sits on top of Sony Pictures Imageworks’ new global headquarters and Miller Thomson LLP, one of Vancouver’s largest law firms. For photos of the Microsoft Canada Centre for Excellence, click here.